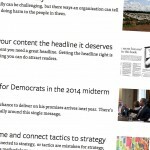 Just over a year ago I set out to create blog to help people communicate better. In that time I’ve received a lot of great feedback, learnt a lot, and reached readers in 128 countries. These articles are the ones I enjoyed writing the most, I think are the best, and have received the best response. One of the early articles I wrote. Based on the many emails I’ve received, probably the most useful. 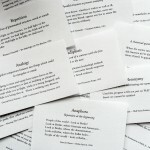 These cards have been downloaded by seasoned speechwriters and novices alike. If you missed these I highly recommend downloading and printing them. This turned out to be my most controversial article. I received a few heated emails because people disliked Matthew McConaughey’s “arrogance”. Even so, it’s a great example of the rule of three. This was a fun article to write. I picked apart a terrible car ad. This is something many organizations struggle with. An important topic to visit and one that got picked up by other websites. Aristotle can be tough to read. 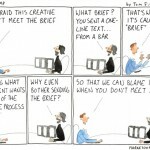 It’s a shame because there’s lots of great insight for communicators. He proposed three modes of persuasion. Something all communicators should know and use.